Make the most of your cage "real estate!" A perch that is also a chewable toy offers dual purpose fun! Add bagels, vine rings or pre-loved drilled pieces of wood to old toys to make them new again! Regular showers are essential for healthy, happy parrots! 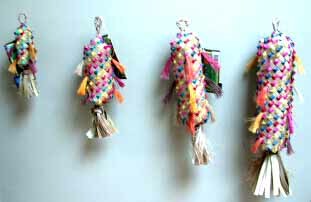 Check cotton and sisal toys (and perches) frequently, keep frayed edges trimmed. All birds should have a variety of perches, different sizes and textures to maintain healthy feet!